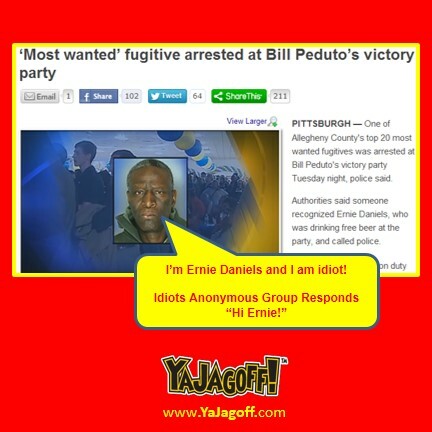 But now matter what it was tooooooooooooo much for 54-year old Ernie Daniels who, by the way, is a most wanted fugitive in Allegheny County according to this report on WPXI. Ol’ Uncle Ernie Boy, if there is any better proof that alcohol causes you to make bad decisions.. (even before you start drinking it) from ugly bar pickups at 2:30am, that you only realize are bad decisions as the sun rises, to coming out of hiding for free food and beer! 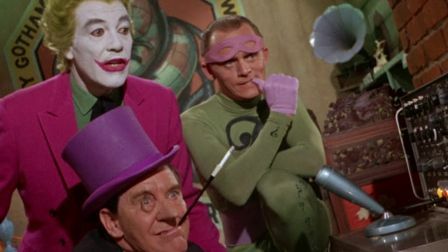 Did you NOT watch the old Batman and Robin shows???? Most-wanted guys hang out in old warehouses with angled floors!! In the meantime, in the words of the Monopoly Man.. “GO TO JAIL! DO NOT PASS GO AND, BY ALL MEANS DO NOT PASS-UP ANY BARS! GO DIRECTLY BACK TO JAIL. All the free food you can handle there. But probably no beer unless ya trade your cigs or your body for it!! Ya know, you woulda been a whole lot less conspicuous if ya had a Richard Nixon mask on. And here’s the BIG KICKER.. you are sucking down food at an election celebration and you didn’t even have one of those “I voted!” sticker on, Ya Jagoff!! !